An animated film has risen to the top spot at the box office and imagine this: it’s not even in 3D. 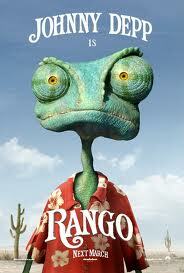 As expected, Gore Verbinski’s “Rango” dominated theaters on Friday pulling in $9.5 million. Depending on Saturday’s gross, the critically acclaimed trippy Western could make anywhere from $38-42 million for the weekend. That’s significantly below the $50 million most of the industry was expecting from “Rango,” but the film’s studio, Paramount Pictures, will have to hope it duplicates the good word of mouth run “How To Train Your Dragon” had just a year ago. Debuting in second was the Matt Damon. The Berlin Premiere of Rango (Feb 20)—Photos! Arrivals for the Rango Germany Premiere at Cinema Kulturbrauerei (February 20) in Berlin. Isla Fisher, Abigal Breslin, Anastasia Zampounidis.